I recommend you do NOT purchase this, unless you are a die hard fan of Jerry Andrus, connoisseur of optical illusions, and or a collector of strange and rare publications. Essentially this ebook has 7 pages of squiggly lines. That's it. If you know what they mean, if you have seen or experienced Jerry's optical illusion which goes along with this, then it will probably make sense to you. Otherwise I doubt you will know what it is for and what it all means. There is no explanatory text. 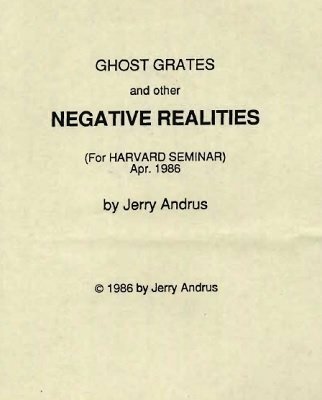 These were the lecture notes for a seminar Jerry gave in April of 1986 at Harvard University. 1st edition 1986, 7 pages.